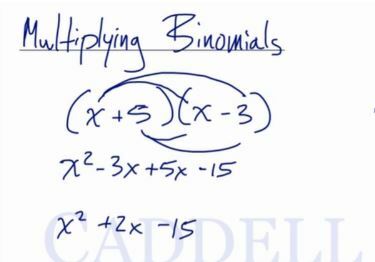 In this video, we are going to look at how to multiply binomials. Some teachers teach this as FOIL (First, Outer, Inner Last). To multiply we have to distribute twice. In this lesson, we’re going to discuss how to multiply binomials. We have multiplied by . Here we have two two-term equation. To multiply them, we have to distribute twice. So, let’s multiply the first term of the first equation to the first term of the second equation then multiply the first term of the first equation to the second term of the second equation. Then, do the same with the second term of the first equation. First, let’s distribute the first term of the first equation to each term of the second equation. Next, let’s distribute the second term of the first equation to each term of the second equation. Let’s combine the like terms. To multiply binomials, you just have to distribute each term twice.